The topographic and geophysical features of the deep impact structure of the Chicxulub crater are reflected on the surface of the Yucatan Peninsula with an aligned arc of sinkholes, forming the “Ring of Cenotes”. 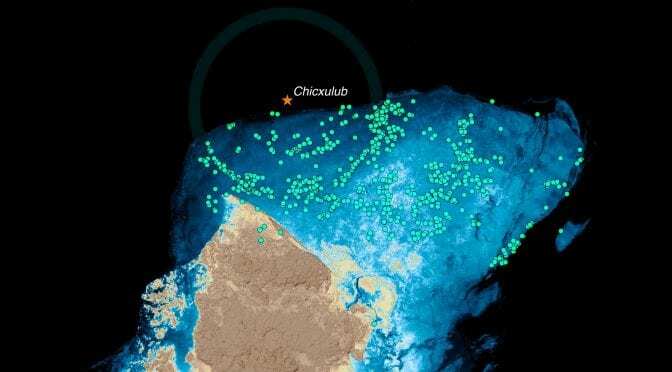 It has been known for almost 40 years that a large meteorite struck the Earth around 66 million years ago in a place in southern Mexico that we call Chicxulub, in the Yucatán Peninsula. It was about the same time that the large dinosaurs disappeared from the Earth. This was a most surprising discovery, since the meteorite crater is extremely well hidden under very thick 3,000 ft (1,000 m) of soft limestone rocks. However, we can see traces of the crater on the surface since there is a great number of very deep and large water filled sinkholes that are aligned along the edge of the crater basin. The local people call these sinkholes “cenotes” (pronounced say-no-tays) in a word tied to the Maya language (ts’ono’ot), meaning “a hole filled with water”. ¿How is it possible that the buried crater, under such thick of rock, can be seen in any way on the surface? All the cenotes that we know now were formed millions of years after the impact in a much more recent period, probably not more than 125,000 years, although it is known that they are related to the geometry of the buried crater. There are a few hypotheses* on the formation of the Ring of Cenotes, all of which imply a relationship with faults and fractures in the Cenozoic carbonates (the upper layer of carbonates that was deposited after the impact). However, there is no detailed explanation of the mechanisms that would operate to create the initial cavities and the mechanism by which the deep crater controls the flow of groundwater close to the surface has not been yet established. 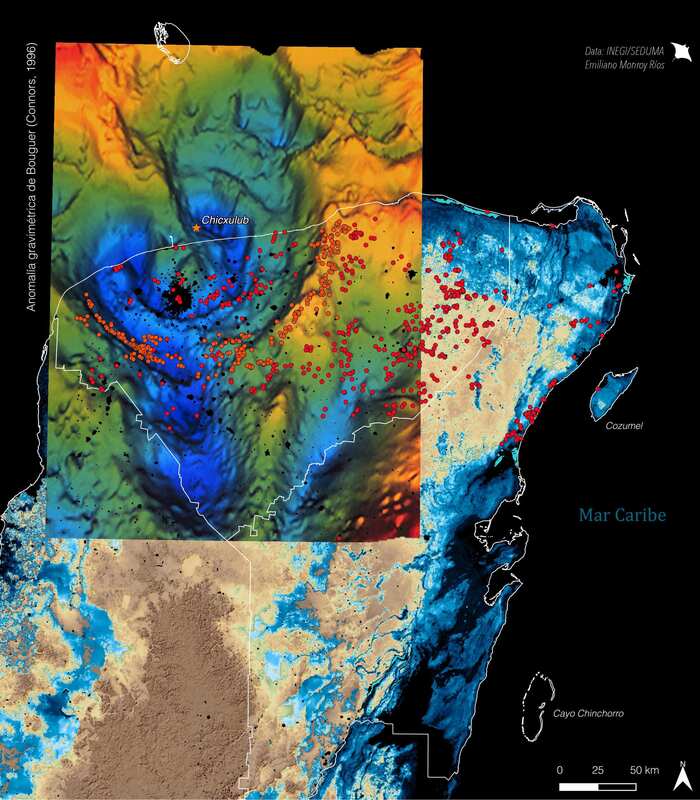 Another non-tectonic hypothesis but that also implies a relationship with the impact is that which involves coral reef patches (leaving more porous and soluble limestone) in the periphery of the “inner sea” Cenozoic Basin, formed as consequence of the impact. However, there is no sufficient evidence for this proposal. *For readers interested in this topic I would recommend to review the information contained in the papers by Pope et al. (1993), (1996); Hildebrand et al. (1995); Perry et al. (1995); and Kinsland et al. (2000). Figure 2. 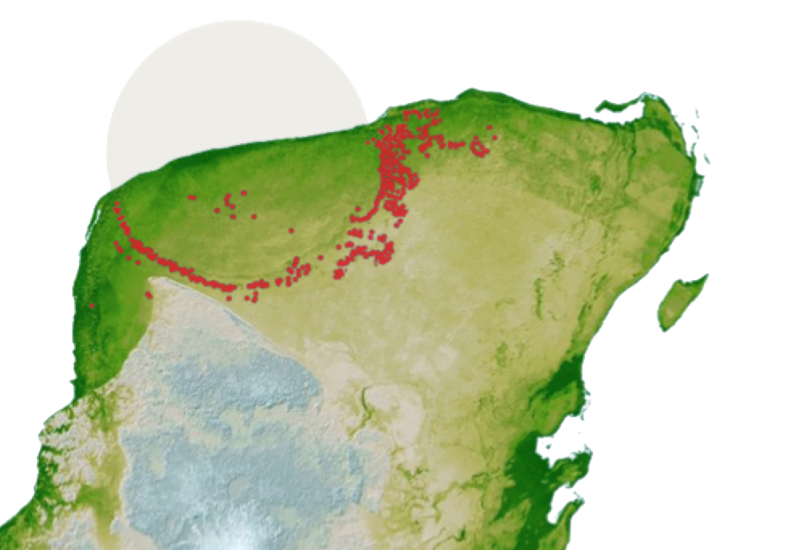 Relative position of the Cenozoic Basin (Cenozoic Basin), a shallow “inland sea” that formed in the depression as a result of the impact and that today is buried within the Cenotes Ring area. Redrawing of Galloway et al. (2000) and Christeson et al. (2001). Modern bathymetry: Dirección General de Oceanografía, Secretaría de Marina Armada de México. My research had focused on the mechanisms that allow this to happen. A working hypothesis argues that even before the impact, the heat of the earth caused water to flow through the rock. The impact crater then changed where and how the water could flow, since in the middle of the crater is now a large solid lump of crystal rock formed by the intense shock of the meteorite hitting the earth. Water can’t flow through the crystal rock, so the water now flows up the sides along the perimeter of the solid lump. It is around the sides of the crystal rock where the soft limestone is now even more dissolved, creating large and deep voids. Over time, some of these hidden caves around the edge of the crater and the crystal rock, keep collapsing, and some of them even reach the surface where we can now see them as the Ring of Cenotes (ROC). ¿What is the mechanism that allows to transfer the geometric information from the deeply-buried crater onto the surface, through +1 km of Cenozoic carbonates? Figure 3. Colored Shuttle Radar Topography Mission (STRM) elevation model from NASA (2000). Overlain are the sinkholes considered as part of the “Ring of Cenotes” (SEDUMA, 2017). The cenotes overlying the crater are deep (150+ m) vertical shafts with most (but not all) breaching the surface. The pit geomorphology suggests a bottom-up formation. In horizontally bedded carbonate platforms, geothermal gradients will drive convective flow, with strong vertical components specifically in the platform center. In the Yucatan Platform, a high occurrence of anhydrite and dolomite at depth evokes early burial dolomitization and anhydritization, sourcing Mg+ from seawater. The Chicxulub impact near the center of the platform produced a low permeability and high thermal conductivity melt rock that arguably extends to the basement rock at ~3 km below surface. Heat of impact enforced the pre-existing geothermal circulation pattern, and even with depletion of the heat of impact, the high thermal conductivity of the crystalline melt would lead to enhanced geothermal gradients in the center of the platform. Figure 4. General geology and hydrogeology cross-sections of the Yucatán Platform based on the published literature on drill core and geophysical surveys undertaken by Pemex, UNAM, and IODP/ICDP (Ward et al., 1995; Gulick et al., 2013); impact geometry and dimensions from Kring (2005); Gulf of Mexico cross-section from H. Levin (2013); deep crustal interpretation is from Christeson et al. (2009). EMR (2018). A) Pre-Impact: Geothermal heat flux from the granodiorite basement into the overlying carbonate strata establishes platform-scale circulation drawing marine water in from the margins, and exiting through the submarine platform top. B) 15-30 sec after Impact: An impactor of ~10 km diameter struck and penetrated Earth’s crust vaporizing tons of sulfate and carbonate rocks through the atmosphere, causing a gigantic tsunami, global wildfires and eventually a mass extinction event. There is a “rebound” uplifting rocks from the deep crust bringing them close to surface within the crater. C) Post-Impact: A deeply-penetrating crystalline melt plug with high thermal conductivity and low permeability is created by the impact near the geometric north center of the platform. D) Present: The now sub-aerial prograded platform includes peripheral sets of fractures around the now deeply-buried melt plug, which provide preferential vertical flow paths. Specifically, the one fracture that aligns with the perimeter of the melt plug is overlain by the ROC. In contrast, caves, caverns, and cenotes that are popular touristic and cave diving destinations in the “Riviera Maya” along the eastern coast of the Peninsula in Quintana Roo from Puerto Morelos to Tulum, are usually shallow collapsed cave systems with wide and branched galleries. In its formation, the depth of contact between deep salt water and surface fresh water (called halocline) plays a fundamental role. Figure 5. 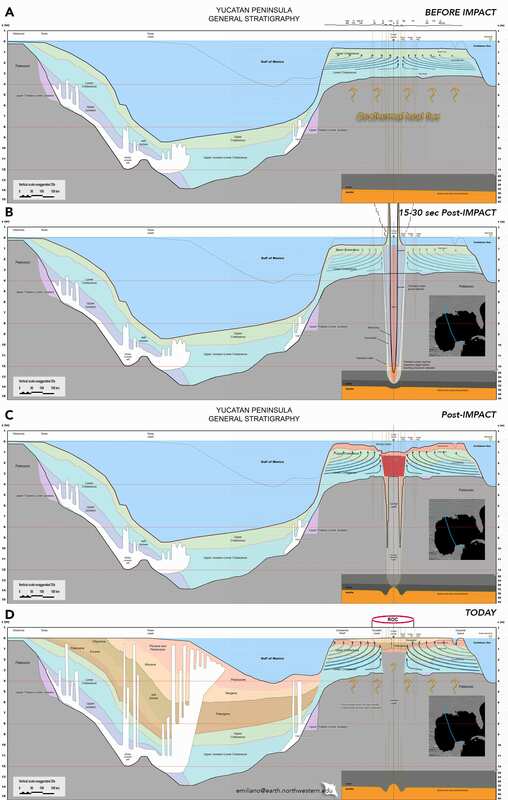 Cross-sections from: Ucil – Lazcano & Knab in: Thomas (2011); Xcolac – Socky et al. (2002); Sabak Ha – Andreas Matthes (Underwater Speleology, 2008). EMR (2018). The figure shows the comparison of different types of cenotes with different formation mechanism. On the left, pit-cenotes that predominate in the center of the Peninsula and along the Ring of Cenotes. In them, flow of deep water is probably involved, favoring the dissolution of the rock from the bottom-up, a process called hypogenic. On the right side, morphology of the most common cenotes on the eastern coast of Quintana Roo, along the “Riviera Maya“. These cenotes are the entrance to systems of less deep caves and with wide and branched galleries. This work was presented for the first time at the annual conference of the American Geophysical Union (AGU) in San Francisco, 2015. An extended and rigorous version is already under review for its probable publication in a peer-reviewed journal. AGU2015: Hydrogeothermal Convective Circulation Model for the Formation of the Chicxulub Ring of Cenotes in the Yucatan Peninsula, Mexico. Connors, M., Hildebrand, A.R., Pilkington, M., Ortiz-Aleman, C., Chavez, R.E., Urrutia-Fucugauchi, J., Graniel-Castro, E., Camara-Zi, A., Vasquez, J. & Halpenny, J.F. 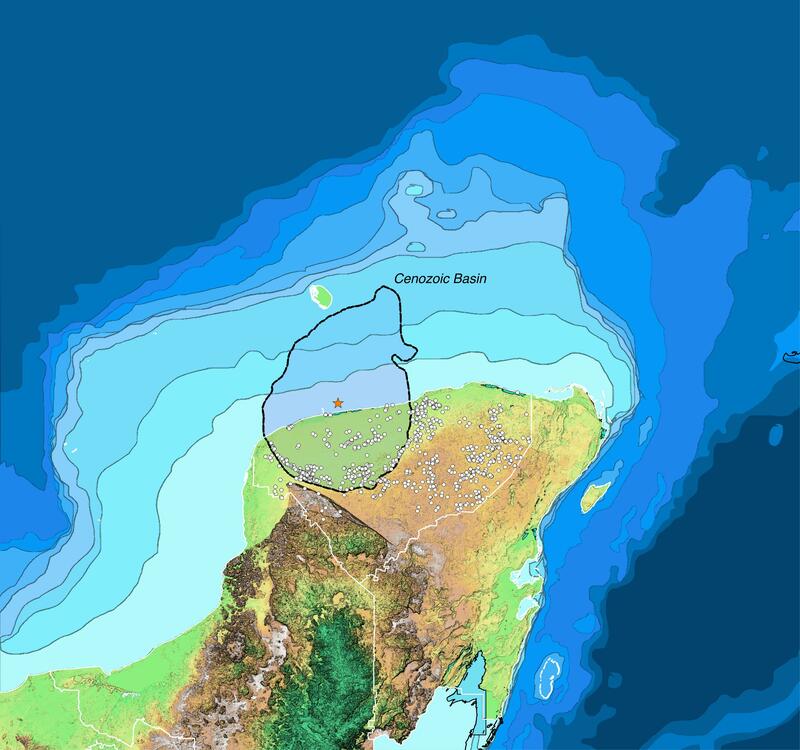 (1996) Yucatán karst features and the size of Chicxulub crater. Geophysics Journal International 127(3): F11-F14. NASA/JPL (2000) SRTM Mexico Images. Shaded and colored SRTM elevation model of the Yucatan Peninsula, Mexico. Original Data: Shuttle Radar Topography Mission (Feb 2000) Jet Propulsion Laboratory, NASA. Perry, E.C., Marín, L., McClain, J. 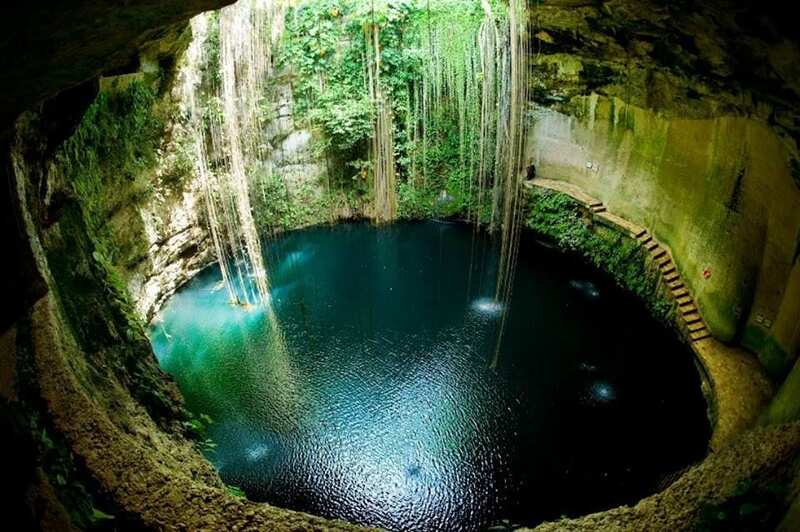 & Velázquez, G. (1995) Ring of cenotes (sinkholes), northwest Yucatan, Mexico: Its hydrologic characteristics and possible association with the Chicxulub impact crater. Geology 23:17-20. Pope, K., Ocampo A.C. & Duller, C.E. (1993) Surficial geology of the Chicxulub impact crater, Yucatan, Mexico. Earth, Moon and Planets 63:93-104. Pope, K., Ocampo, A., Kinsland, G., & Smith, R. (1996) Surface expression of the Chicxulub crater. Geology 24(6):527-530. Thomas, C. (2011) Cuevas de Yucatán. La región de Valladolid. Vol 1. Ed. Xibalba, 164 p.